Hello, hello! It’s time for a new reveal! 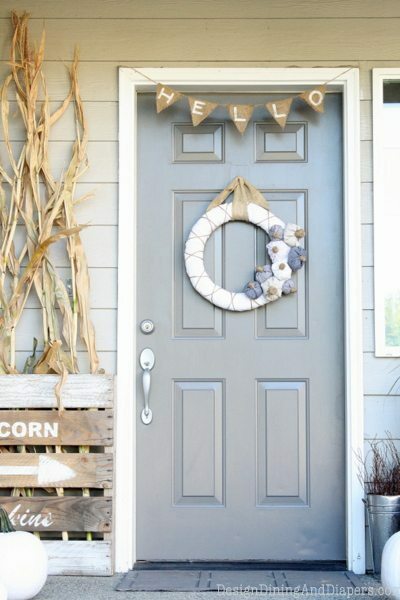 Last week, I showed you my Neutral Fall Wreath for this year and it inspired me to decorate my whole porch for fall. If you were around last spring, you might remember my budget porch makeover, which gave my porch a whole new look. Before than, I didn’t really decorate it for different seasons because it was so, well, blah. So this was the first time I have EVER decorated my porch for fall and I had so much fun! Welcome to my Neutral Fall Porch. I used my Fall Pumpkin Wreath as my inspiration for the porch and created a neutral, yet festive fall porch. I used crisp whites, natural tones from the corn and burlap and gray (even though it looks more like blue in the pictures). Can I tell you how happy this porch makes me feel? I love fall and every time I pull into my driveway and look at my porch I get a huge smile on my face. I was too impatient to wait for the white pumpkins to arrive in stores, so I bought carving pumpkins and spray painted them white. It was really simple, I just taped the stems and gave them a few coats. I created this vintage farmhouse sign by painting a pallet and then distressing it. The town I live in is surrounded by farms so I thought I would give my porch a little country flair. I actually picked up a bundle of corn-stalk from a farm down the street (I even walked out into the corn fields with her while she cut it down… have I told you how much I love where I live?). But after doing some research I realized my green corn stalks weren’t going to brown for another month, so I gave in and purchased these at the grocery store. The burlap bunting was a last-minute addition and I think it makes the porch a little more welcoming. Oh fall makes me so happy! What about you? Do you decorate your porch for each season? Ahhh! So, so cute! I love the neutrals and the fun sign you made! I absolutely love this Taryn! 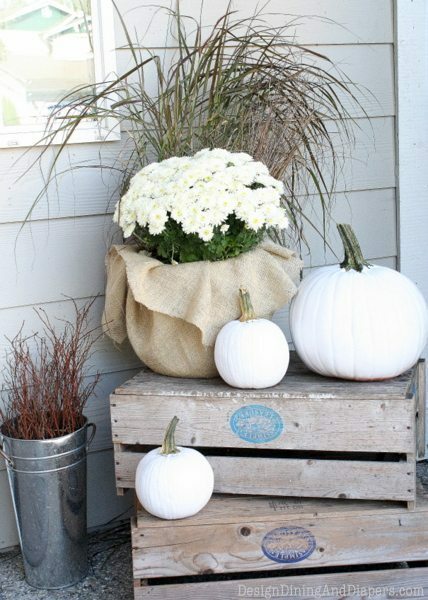 The white pumpkins are classic and I am in love with the pallet. I have a pallet in my backyard that’s been there for a few years now. I always think that I should do something with it, thanks so much for the inspiration! I just love the fresh corn sign! In patiently waiting for the weather down her in AZ to cool off enough to decorate outside more! Love how you used the crates as well! Love, love, LOVE this!!! It’s absolutely GORGEOUS Taryn!! 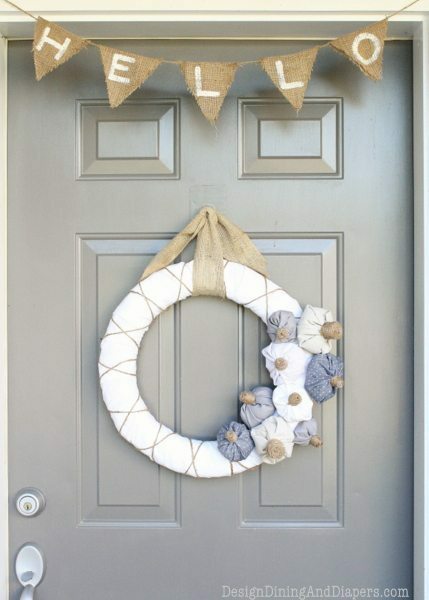 I love the neutral color scheme, I adore that pallet sign, and your wreath & bunting are the perfect touch to your front door!! Beautiful! Alright, I am in love- I need your address so I can see this in person- Because this Rocks! I LOVE how simple this is, so easy and pretty on the eyes! You did a fantastic job..oh you just inspired me!! Your the best! wow Taryn! I’m in LOVE with your porch! 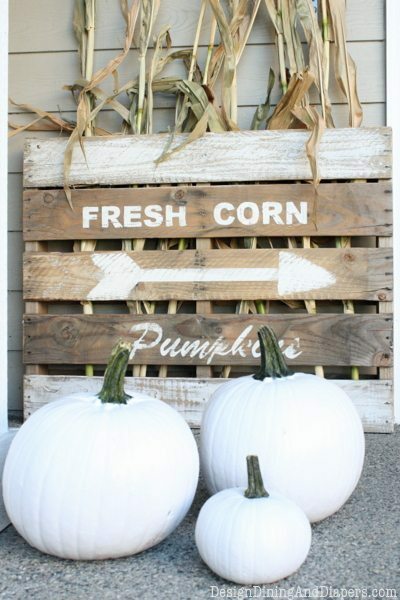 Everything is beautiful from the pallet sign to the bright white pumpkins and I love the burlap bunting! AH – it’s gorgeous!!! this is soooo great! I really need to get on it and start decorating! Looks amazing! Great job! I am in love with your gray door, in fact as I’m reading your post I kept glaring at my door wondering if mine would look that good gray too. Wow! This is amazing! Love every single detail! : ) Sharing and Pinning! Love your neutral fall porch – my mantel shares some similar shades of grey, tan, and white. Love it! This is so very cute and pretty all at the same time, while being very festive. I adore the wreath. It is adorable! Also ve what you did with the corn stalks and the cute sign in front of them. Very creative twist on cornstalks. Love it! Thanks for inspiring us. Happy Fall to you! Taryn, I too have never decorated my front porch for fall, but this year I ventured to give it a shot. I didn’t go quite as neutral as you, but I did include greys as well, and was surprised at how well it went with other fall colors. Best wishes as you head toward the holidays. Develop a floor plan and layout your furniture prior to remodeling your sun porch to create an organized, functional and aesthetically pleasing family room. Absolutely stunning! I love the white and grey against the burlap embellishments! This is so pretty and such a different look for Fall. Love your farm-style sign and the burlap banner “hello” is the cutest! Lots of good ideas. I’m inspired! Taryn – I just love the way your front porch turned out!! You did a beautiful job!! I have enjoyed visiting your blog! You are very creative!! Wow I love your front porch! The white mums are so pretty and I am jealous you found them. Everything looks so great with your wreath!. Love the colors and simplicity! I just repainted my front door and really like the color as well. I think the color of yours is perfect and I can see why you’re happy when you pull up to your house. Love what you have done with your house! Now I want to repaint the front door Gray! Will need to buy some crates for height! Fantastic! This is so beautiful! I love the neutrals. So gorgeous. Good job! 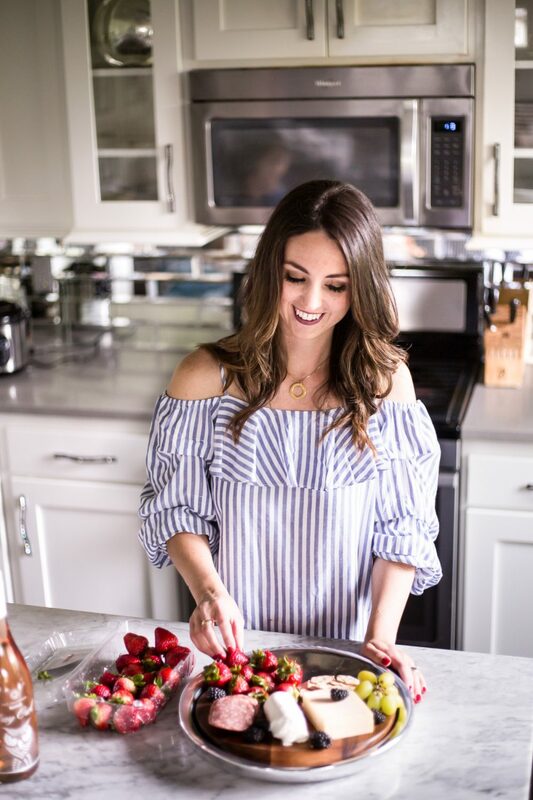 I am never surprised when I click on a fabulous thumbnail at a linky party and find myself here at your blog…. I just give a little chuckle and say to myself, “I should have known it was Taryn!” Your porch is fantastic. Beautiful color combo and I love the pallet. Taryn this is incredible!!! 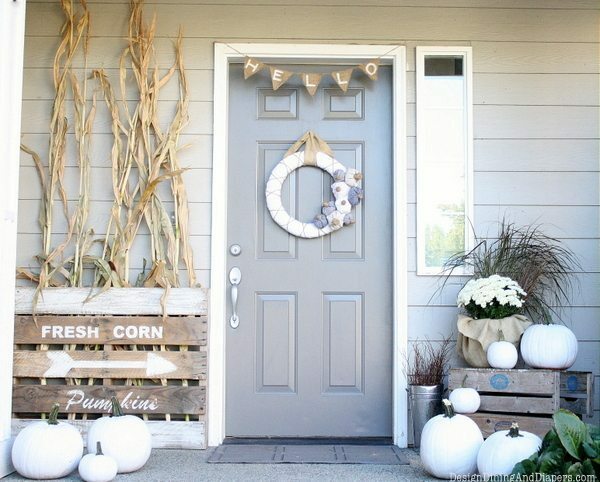 I absolutely love the pallet and the corn stalks and the banner and the wreath..ok…I love it all! LOL! Thanks so much for sharing it with us at Inspiration Friday! It’s amazing, so different from the usual orange/brown vignettes. I came here from inspiration Friday party. So fresh and pretty! Love the faded sign, too! Very Pottery Barn-great job! This is a gorgeous fall display! I love all the individual touches you added! Your pallet sign is adorable! Oh my gosh! I love this…all of it :) I would be thrilled if you would share at my Fall Decor Party! I LOVE your pretty porch! Maybe, because I’m going for a similar look at my own home! I love the challenge of making a cozy fall look without oranges, golds and reds. Nice job! You’ve created a gorgeous porch for fall! I wish mine was a little larger so I could do all those fun things. So unique, and so very beautiful!! You are very talented! Looks beautiful! I love all the texture. I LOVE THAT SIGN! I love how unique it is and the white against the wood. Your porch is soooo cute. Goodness this is so cute! Love, love the pallet sign! Need to make one asap! Found you from pinterest, now your newest follower! I LOVE the color of your door! I’m loving your fall porch! 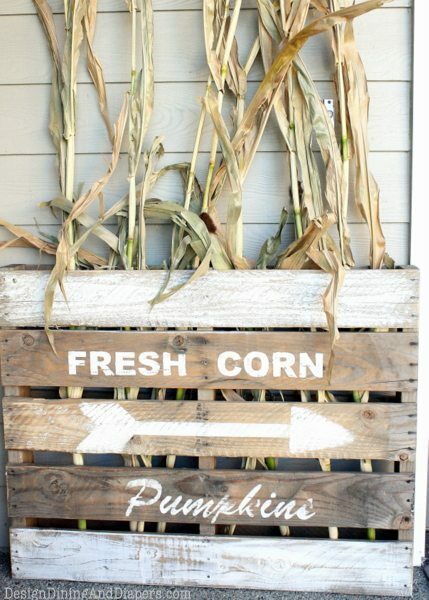 Great way to display the corn stalks – keep ’em a little corralled! I LOVE this!!! My hubby and I were just talking about how I don’t like to decorate for fall because I don’t like fall colors! This is perfect!!! LOVE!! Sure like your pallet sign. Do you mind if I use your idea? I know mine won’t be nearly as good but will try to give it a go. I started a sign in Sept. but woe is me it just didn’t make it. Have to resand and try again with something else. I also am going to check out your holiday burlap pillows. Love making things with burlap or paint cloth and pillows or table runners especially. I’m a new subscriber so will be visiting often, sure like what I see so far. Taryn, you always seem to amaze me! LOVE this entire fall front porch.Completely in awe of the color scheme. Great work!! I love your porch, it is just gorgeous! I’ll be featuring it tonight! …love this – so calming with the neutral colours! I love the neutral colors. I wish I could get white pumpkins here…but I’ve decided I’m going to use a can of spray paint on some orange ones. Thank for the inspiration! I love how peaceful it is! A white Halloween decoration!,So neat and pretty, totally different from the usual decoration I see here in our neighborhood and the ones that I’ve been using for years. You have inspired me and will certainly try this one next year. 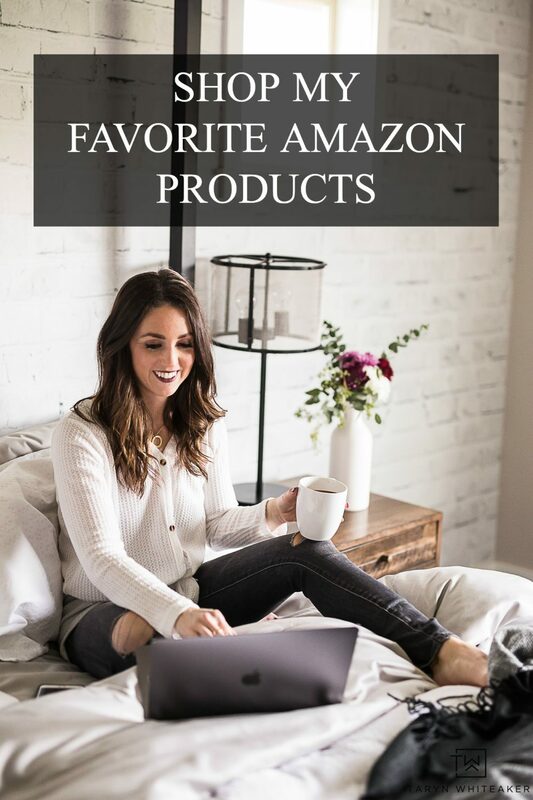 Hi Taryn, Just wanted to let you know that I loved your Fall porch so much that I’ve featured it in my post. So pretty, neutrals are my absolute favorite – my FB fans will love it. Sharing it today! Just loving this whole celebration your porch is having! I was just wondering if you have a link for the stencils used on the pallet? Yikes !!! I tried to make the sign and all my stenciled letters bled? And yours looks fabulous!